:: ASC :: Be Earthquake Safe! « Website Guide » Home » Be Earthquake Safe! The hazards associated with earthquakes are numerous. In addition to knowing what to do when the earth starts to shake, you must be prepared in advance, at home or at work or at school. Once the ground has stopped shaking you should then be ready to face secondary dangers such as fires, tsunamis, etc. Though often forgotten, but always present are the psychological effects of an earthquake, faced by both, children as well as adults. This page attempts to summarize and provide offsite web links to other pages that will help you and your loved ones to face an earthquake crisis in the future. 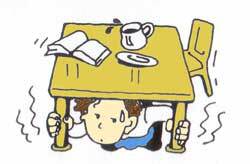 DURING an Earthquake - If you are INDOORS when an earthquake hits "Drop! Cover! Hold!". DROP to the floor, head for COVER under a firm table and HOLD onto it. Large earthquakes can send people and furniture sliding around like toys. Do not try to run outside as falling debris such as broken glass, bricks, etc. can be lethal. If you are OUTDOORS, stay away from buildings, bridges and electricity lines. Do not attempt to enter buildings and if you are driving stop at the side of the road immediately. AFTER an Earthquake - If you live near the sea, you should immediately head for higher ground to protect yourself from tsunamis. If there are no hills or high ground near you, head inland. The further you are from the sea the better. Stay there till you are sure that the danger has passed. After an earthquake, be prepared to handle some small situations on your own. Emergency and medical services will be overwhelmed and will be forced to tend to the most serious of situations only. You should have knowledge of basic First Aid and a good First Aid kit is a necessity in every home, school or office. Turn off the electricity and use torches (flashlights). Do not attempt to use matches or cigarette lighters! Check the gas valves (turn off gas mains if you receive piped gas) and sniff the air for gas leaks. Open windows and doors if there is a leak immediately. Always keep a fire-extinguisher on hand and make sure it is in a good working condition. Buildings should be constructed according to specific guidelines laid done by your country's building codes. Stay outdoors after an earthquakes as they are always followed by aftershocks, which could cause further damage to buildings and might even cause already weakened structures to collapse. Is the structure of your home / work place / educational institution safe? ◦ INTACH, A Manual For Emergency Safety Measures in Damaged Masonry Buildings. ◦ Bureau of Indian Standards, Earthquake Building Codes. After a bad earthquake critical medical facilities such as hospitals and ambulance services will be stretched to their limits. Some buildings might even be damaged and the injured and patients alike will have to be treated outdoors in open areas. During times like this, most medical services follow a triage system. This basically enables them to focus their efforts and existant supplies on those who very urgently require assistance. Because of this you or a loved one might be turned away if the injuries are not life threatening. Hence YOU should be able to deal with minor injuries and other things such as fractures, etc. Learn C.P.R. and other first aid techniques that could help yourself or others in the wake of a major disaster. Keep an up to date First Aid Kit and check it frequently for expiry dates. You might also want to add a list of allergies and other medical conditions that you or other members in your family might have, in it as a safetly precaution. Earthquakes might break pipes that supply water for household purposes and also sewage lines. Diseases might spread due to lack of proper sanitation and hygenic conditions that might exist in open air camps. Always boil water before you use it. Earthquakes can rupture electric wires and lead to short circuits. Many homes have cooking gas cylinders or receive piped cooking gas. These can be damaged by falling debris. Smell the air for leaking gas. If you smell gas, open all windows and doors. DO NOT SWITCH ELECTRICITY EITHER ON OR OFF. Whether you have a cylinder or central gas, make sure EVERYONE at home knows how to turn off the gas valves. Do not use candles or lighters. Use a battery powered torch instead. If a fire does break out in your home, make sure you know what kind of a fire it is. If it is too big, call the fire brigade immediately. If it is small try and deal with it yourself if you have adequate knowledge about putting out fires. The best and safest way to put out a fire is to use a fire extinguisher. When using an extinguisher to put out a fire, aim at the base of the fire. A fire extinguisher is always the best option as an earthquake might sever water pipes and thus leave you stranded without water to fight a fire. DO NOT ATTEMPT TO PUT OUT AN ELECTRICAL FIRE WITH WATER. Throw mud or sand on the flames to extinguish them. A burning electrical transformer is best dealt with by calling the fire brigade.